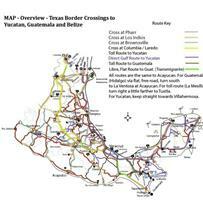 Most popular route to Yucatan, Belize and Guatemala. Considered safe, RV'ers like that it is 80% toll road. Enough RV parks but you may have to boondock one night. Plenty of hotels. Two mountain ranges to traverse. Monterrey-Saltillo generally no problem. Rises to about 6,000 feet (1,830 meters) on good road. In winter may snow or ice. Tougher mountains between Puebla and Orizaba. Toll road hits elevations of about 8,000 ft. (2,450 meters).